Welcome to another challenge at DYSU!! This week we want to celebrate those great creatures God put in this planet to make us happy, yes we are talking about the four legged friends. It may be your pet or a fascinating and exotic wild animal. All of them are pretty wonderful creatures that deserves our protection and respect. 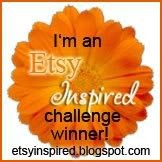 So let's see what you can come up with inspired by 4 little and cute legs!!! For my card this week I used the image Critters Balloons Cat from Bugaboo Stamps. I have two cat daughters so this image was just perfect for me. Instead of coloring I paper pieced the image and added two additional clouds. Then I stamped the sentiment and applied some mini rhinestones which I colored with my Copics (they were clear). I also sew my card... Yes!! After so many time I finally have a new sewing machine thanks to my auntie. I love sewing in my cards!!! Hope you have a great day and see you at DYSU!! Such an adorable card. 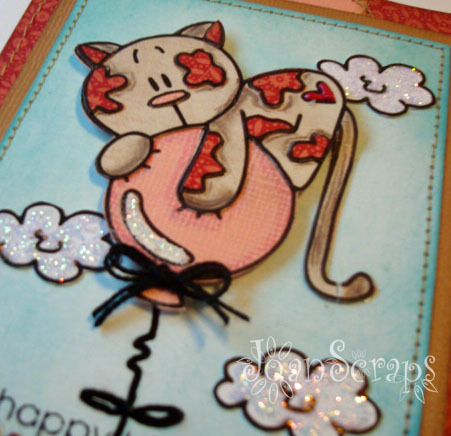 Love that cute kitty and your sparkly clouds. 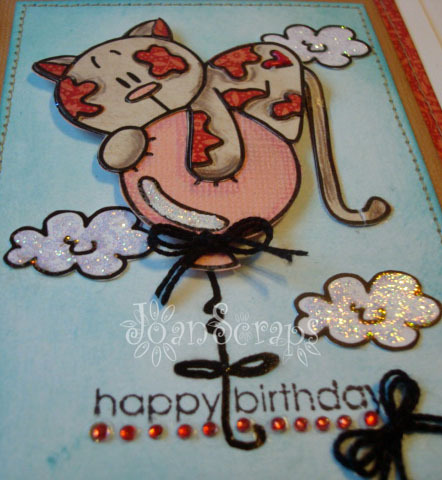 I love your sweet card Joan, fab papers and layering. Me encantoooo, que chulo ese gato. El sello es asi, con todo y nubes? Upss, ya lo vi. Encantador. That's incredibly sweet, Joan! Love what you did with that cutie! 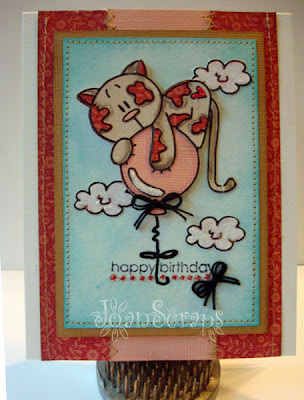 Your card is SO SWEET Joan! The clouds are my favorite! i love how the sparkle and the sentiment has some cute bling too! I absolutely love it, Joan.